Remember this start? I finally got a Work in Progress completed. A pretty big one, too. This post is a little heavy on the pictures, but the boys and I had a good time in the fall weather this afternoon. This is meant to be a picnic quilt for my family, so I chose to hand tie it and sew it right sides together and flip it, so no binding. 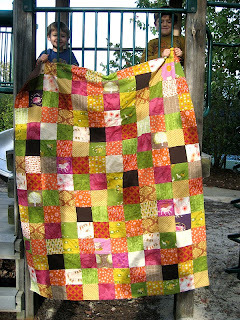 Pretty quick way to finish a quilt, but not without its challenges. 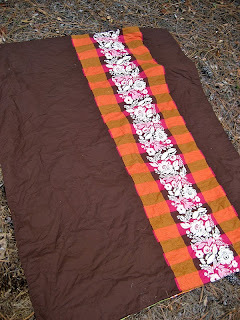 The back is Kona Chocolate with a row of Anna Maria Horner's Good Folks Festival in Zinnia. I had been saving that Festival for something special and I'm so glad I did. Hoarding pays off. Eventually. The quilt tag was born out of necessity, I must have slashed through a block when I was cutting and didn't notice until it came out of the wash. I just embroidered my name on a leaf and blind stitched it on. The positioning on the quilt is quite akward, but it came in really handy. Hand tied with brown perl cotton. The edges got kind of folded when I washed. I used many favorite fabrics in a fall color palette. You might be able to spot Heather Ross Far, Far Away I, II, and III as well as her West Hill line for FreeSpirit. I have Anna Maria Horner Good Folks, Innocent Crush and Loulouthi, Joel Dewberry Aviary II and Modern Meadow, Amy Butler Midwest Modern, David Walker Venice, Too Muchery, and more. I also have some baby wale corduroy in chocolate and some natural linen (I love having those with quilting cotton, double guaze, cotton canvas & various cotton/linen mixes). 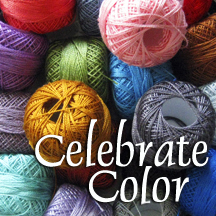 I am linking up to Celebrate Color! Come back tomorrow for some more info on the hand tying and a giveaway - I have over 60 charm squares left from this & they are yours for the winning to make your own fall patchwork project - lots of Heather Ross & AMH! 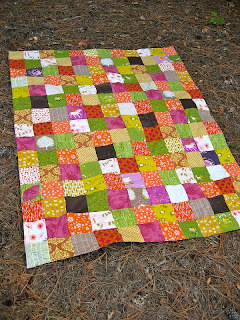 Oh i love all the beautiful fabrics in your quilt, so bright, fresh and happy! This is a happy quilt, one to use making happy memories! Love all the colors and fabrics used! They really make this pretty quilt pop. 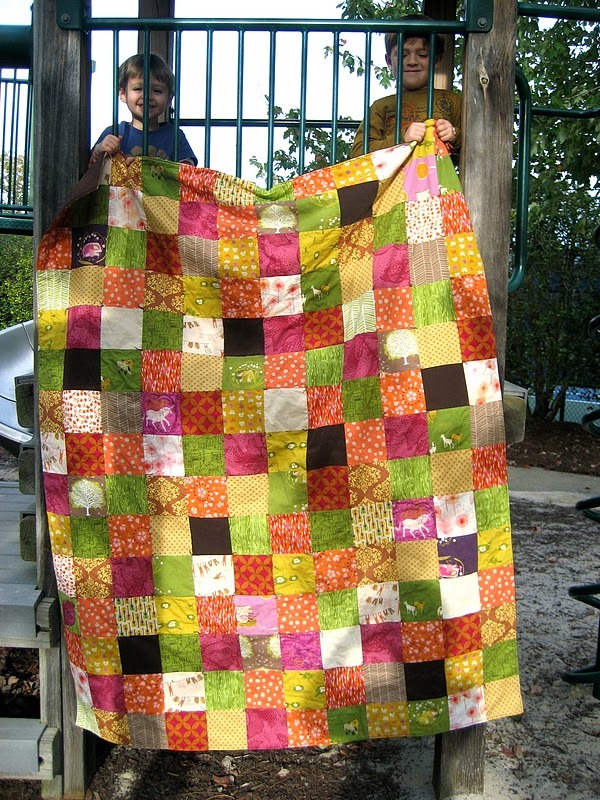 Great picnic quilt! Love your first pic with the little guys holding it - they seem to realize they have an important job! precious. Yeah for picnic quilts! And, you're right, that AMH on the back looks stunning.